The last time the unemployment rate fell below the 4 percent threshold was in 2000, during a period of frenetic activity remembered as the dot-com boom. Nine years into a sustained, if less feverish, economic recovery, that milestone has been achieved again. The Labor Department said Friday that the jobless rate in April fell to 3.9 percent, raising anew the question of just how tight the labor market can get, and for how long. In the past half-century, only the late 1960s brought an extended period when the rate stayed below 4 percent. “We’ve continued to add jobs routinely every month for so long, and the unemployment rate we have reached is amazing,” said Catherine Barrera, chief economist of the online job site ZipRecruiter. The steady-as-she-goes economy has produced a record 91 straight months of job growth. That may represent a healthier foundation than the dot-com era, when pride — or, as it was branded, “irrational exuberance” — went before a fall. But the banner number announced Friday did not resolve any of the broader questions that economists have about this unparalleled run. 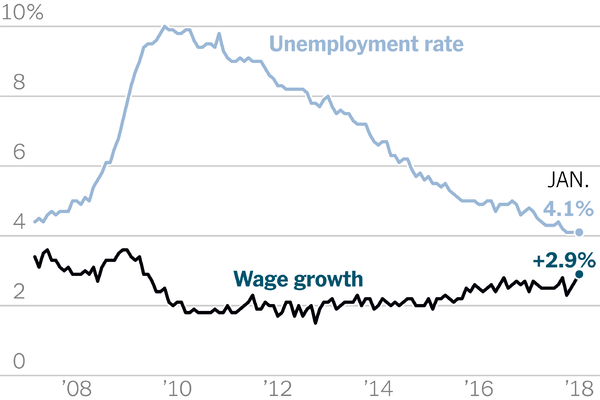 The most prominent is a mystery that has proved impervious to easy explanation: why wage increases haven’t been more robust, when the market continues to edge toward full employment. Friday’s report showed that hourly earnings went up by 2.6 percent over the past year, not much faster than inflation. The subdued wage gains eased the prospect that the Federal Reserve would accelerate its plans to raise interest rates, helping to send stocks higher. But lagging pay also reflects how the economy of 2018 is fundamentally different from earlier eras. “A 3.9 percent rate today doesn’t suggest as tight a labor market as 3.9 percent in 2000 or 3.9 percent in the late 1960s,” said Ellen Zentner, Morgan Stanley’s chief United States economist. A lot has changed since the turn of the century. The share of working-age women in the labor force began to fall in 2000, after increasing for decades. Men have been dropping out for much longer. The upshot is that a smaller share of people are participating in the labor market, and it’s easier to get low levels of unemployment when fewer people are vying for jobs. In fact, a shrinking labor force in April is part of why the unemployment rate fell to 3.9 percent from 4.1 percent even as payrolls grew by a fairly routine 164,000 jobs. The population is also older than they used to be, on balance. The baby-boom generation has moved steadily toward retirement over the last two decades. And those still working have not helped push wages up. Generally, workers climb the economic ladder fastest when they are young, and so an older work force may weigh on average wages, economists say. In 2000, wages for rank-and-file workers rose at an annual rate of around 4 percent. Part of the problem now is that some 60 percent of the jobs added since 2010 have been in low-wage, service-sector jobs, according to Morgan Stanley. Fifty years ago, there were plenty of factory jobs paying a decent wage, and unions held much greater sway. Manufacturing accounted for one in four jobs; today it’s not even one in 10. The tech explosion of the late 1990s gave rise to lucrative roles in companies based on new business models. The share of the economic pie going to workers rose steadily for the first time since the 1970s — a feat not repeated since. “No one is creating an e-commerce group out of nothing anymore,” said Tom Gimbel, chief executive of LaSalle Network, a Chicago staffing firm. Instead, companies are bulking up their warehouses to compete with Amazon, slotting in tens of thousands of relatively low-paid pickers, packers and stockers over the past several years. Mr. Gimbel said he had seen a particular hunger for new bodies in call centers, which offer candidates the minimum wage to deal with consumers’ complaints about the gadgets they ordered online. More recently, Mr. Trump’s flirtation with a trade war has thrust uncertainty into the economic picture. The White House has provided little clarity about whether its newly imposed steel and aluminum tariffs will extend to allies like Mexico, Canada and the European Union, and it seems no closer to smoothing over economic tensions with China. Economists say it is too soon to tell how employers may change their hiring or expansion plans in response to the tariffs on Chinese goods, or to Beijing’s retaliation. But there are signs that companies that buy metals are feeling the effects already. The Institute for Supply Management said this week that manufacturing activity grew in April at its slowest pace since July. Uncertainty over the price of raw materials could prompt factories to cut back from their recent hiring spree. Manufacturers added 73,000 jobs in the first quarter, much more than in the same period last year. “A faster pace of wage growth would be great for households, but in a way that would create even more difficulty for policymakers,” Ms. Zentner said. An acceleration could force Fed officials to raise rates more aggressively, which would raise the cost of car loans and credit card debt. However mixed the blessing, Ms. Zentner said, the ever-tightening job market could soon force faster growth in paychecks. “We are getting closer and closer to that flash point, but we don’t know exactly when it is going to happen,” she said. A wave of bigger raises has already reached Chandler Steffy’s roofing company in Clive, Iowa. Three years ago, Mr. Steffy could pay laborers less than $15 an hour. No longer. In March, the latest month measured at the state level, the jobless rate in Iowa was 2.8 percent, one of the nation’s lowest. Mr. Steffy now pays roofers $25 an hour, including benefits. His rate for subcontractors has been spiking. It went up 7 percent in March, and will rise another 7 percent in May. There will be bumps in June and August, too. It’s all Mr. Steffy can do to keep himself in the game. “There’s a price war going on for labor,” he said. He has had crews leave job sites before finishing a roof because they got a better offer from another contractor. “The next 18 months are going to be crazy,” he said.